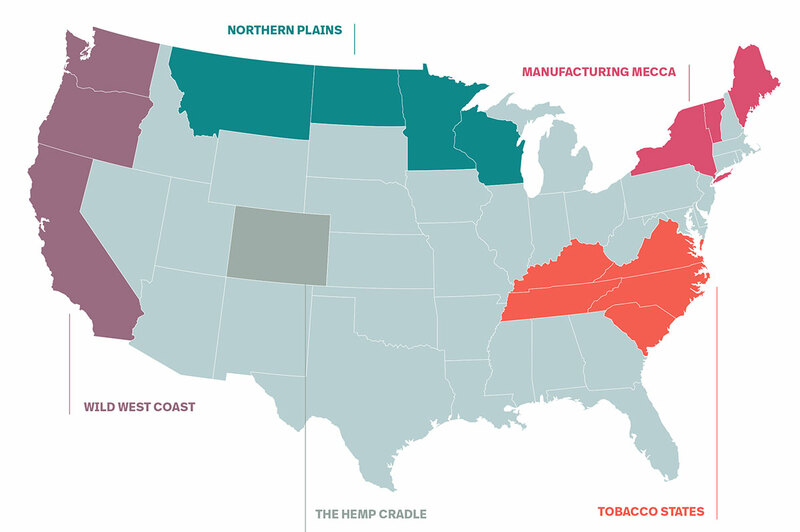 As the hemp industry has grown, a variety of states also have developed in different ways. Here’s a look at how the industry has developed – and what hemp entrepreneurs can look forward to – in the different regions across the country. For years, Colorado led the nation in industrial hemp production and manufacturing. But with limited water and cold winters, how long will Colorado remain a top-producing hemp state? California and Washington state pioneered marijuana cultivation and have climates perfect for hemp production. But both states have negligible hemp industries, likely because of fears that hemp production would damage thriving marijuana industries. Oregon has a vibrant industry of hemp-flower producers, but high land costs and vigorous testing requirements for the plant may hinder market expansion as other states invest in production. Active hemp states included in this region: California, Oregon and Washington. The Northern Plains states dominate flaxseed oil production, and they have climates and infrastructure that make hempseed oil production an easy pivot. Like the Prairie Provinces of Canada, the Northern Plains states have wide-open spaces and enormous farms that can scale quickly. Active hemp states included in this region: Minnesota, Montana, North Dakota and Wisconsin. New York has set aside millions of dollars to attract hemp processors, and Maine and Vermont have attracted major processing operations, too. High land and labor costs mean northeastern states are unlikely to become a cultivation hub, but processing investments could pay dividends for an industry with limited processing options. Active hemp states included in this region: Maine, New York and Vermont. States with a strong history in tobacco production have climates amenable to hemp production, low labor and land costs as well as public officials eager to assist a new industry to replace tobacco production. Active hemp states included in this region: Kentucky, North Carolina, South Carolina, Tennessee and Virginia.